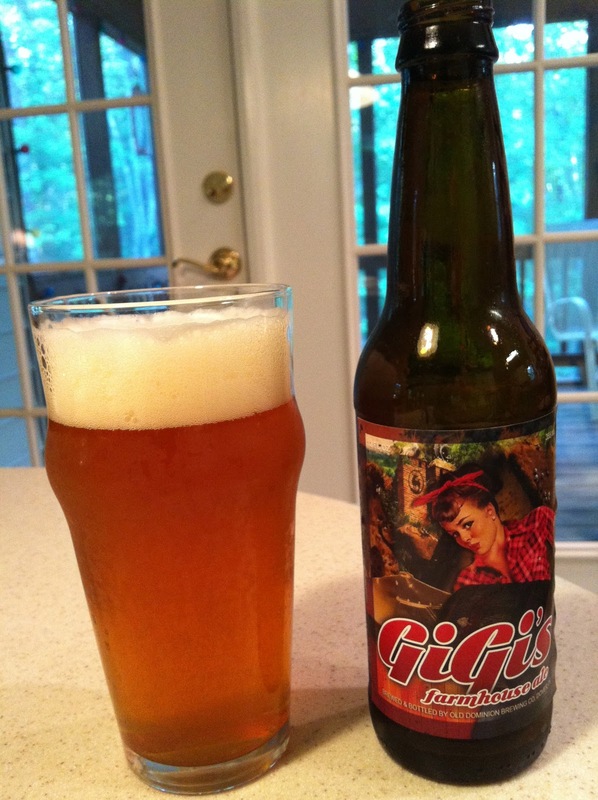 Gigi's Farmhouse Ale pours a copper-orange color with a frothy white head. The aroma is a yeasty, slightly funky malt, with cloves and a hint of citrus. Tasting the beer I was at first struck by the Belgian-ish funk and bitterness. Then the complexity of the Saison-style follows. I get hints of cloves, bitter citrus fruit, cinnamon, pepper, and tart apple, to name a few. The finish has a drying bitterness, with strong pepper and yeasty flavors lingering behind. The 7.2% ABV is well-masked allowing the spicy flavors to come through unhindered. GiGi's Farmhouse Ale is the summer entry in the Dominion "Pinup Pack" assortment, along with the previously reviewed Double D IPA and Morning Glory Espresso Stout. While the other two girls are available in stand-along six packs, GiGi's is available only in the variety pack or on draft. Candi, a Belgian Tripel, will replace GiGi in September. I'll be looking for a "date" with Candi this fall.